Forever Repurchase | emma etc. 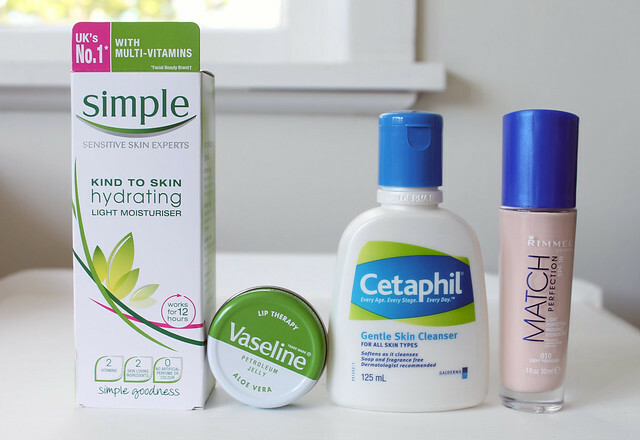 I've probably mentioned most of these products on the blog but I thought I'd round up a selection of things that I have found myself repurchasing again and again or I know I will repurchase in the future. The first is a goodie but a simple one (hah) in the name of the Simple Kind To Skin Hydrating Light Moisturiser. I find this fits my needs when it comes to moisturiser and if I'm honest it works so I don't stray away from it. It's gentle on your skin and is refreshing as well as pretty good at putting moisture back into the skin after cleansing. It's affordable too, I think I've gone through about three of these but it's really not hard to as I have a proper skincare routine in place and use it everyday morning and night. The second is a pretty basic product and something pretty much everyone should have - it's a simple pot of Aloe Vera Vaseline. While this stuff is not exactly long lasting on the lips, it's a quick fix for dry or chapped lips that's sorted right away. It's perfect for a base under any type of lip product that requires a bit of smoothing first. Cetaphil is the only cleanser I have really used. Before using this, my skin was just plain awful really. This cleanser softens while it cleanses so I find it helps me put a bit of moisture into my dry skin. I think it's really important to wash your face properly while sticking to a routine so your skin settles down and doesn't react to the overload of products you're giving it. This typically lasts me quite a long time so I'm okay with the slightly bigger price tag compared to some cleansers. I think there's not really any widely known cleansers out there, I'm sort of scared to try something different because my skin works fine with this product. Lately I have been finding foundation just too heavy for my skin and have been opting to use the Lush Jackie Oates Supplement as a sort of concealer on the odd days, but for when I want to put foundation on my face I really like the Rimmel Match Perfection Foundation as it doesn't make me look orange as I'm pretty much as pale as you can get and the formula isn't super drying. I've actually done a post on this foundation so if you want to find out more about this beauty you can click here. What are some products that you just can't live without?